Below is commentary from WPF Executive Director, Alex de Waal, regarding the evolving situation in Sudan. BBC radio, “Focus on Africa.” Alex de Waal interview is at 1:50 – 5:15. In this interview, de Waal discusses the news that former Sudanese President Bashir has been moved to Kobar prison. What’s left is “Bashirism without Bashir,” said Alex de Waal, executive director of the World Peace Foundation at Tufts University in Massachusetts. Defense Minister Ahmed Awad Ibn Auf, who announced the coup, stepped down as head of transitional military council less than two days later, as protesters raged against a prominent member of al-Bashir’s regime wielding power. On Sunday, the council announced the general is retiring and that Sudan’s ambassador to Washington, Mohamed Ata, the former head of the National Intelligence and Security Service, is being replaced. Salah Gosh, who twice served as NISS’s chief, resigned Saturday. A restructuring of the service is promised. Gen Ibn Auf and his collaborators cannot have been so naïve as to assume that their gambit would satisfy the opposition. Rather, they are buying time so that they can decide whether to follow the path of repression or co-option, or more likely a bit of both. Sudan has taken one step back from the precipice of bloodshed on the streets of the capital, but only one. If the 11 April coup turns out to be a step towards democracy, it will be despite what the coup makers wanted, not because of them. On Thursday, a cabal of military officers, security chiefs and paramilitary commanders overthrew President Omar al Bashir, who had been in power since 1989. All were Pres. Bashir’s most senior lieutenants. Their intent is clearly to keep the existing system intact—with all the power and privilege that they enjoy. But it was one of the least competently organized coups in history: there was a conspicuous power vacuum as the military and security leaders argued over what they should do and who should be in charge. It will be tempting for the United States, the United Nations and the African Union to congratulate General Ibn Auf on the overdue removal of Mr. Bashir and the promise of stability, and leave democratic change to news bulletins. That would be a mistake: The work of solving Sudan’s problems is only just beginning. The first challenge of preventing civil war among the branches of the security apparatus has been averted, at least for now. But the economy remains in free fall. The main reasons are mismanagement, corruption, unchecked spending on the security sector and the loss of oil revenues after the secession of South Sudan in 2011. The economic malaise was so deep it could not be fixed by the United States’ easing of sanctions on Sudan. Nor could it be fixed by an injection of Arab cash, which might ease the crisis for a few weeks but cannot fix the fundamentals. Without serious progress toward democracy and a resolution of the continuing wars in Darfur and the Nuba Mountains, Sudan will remain at the precipice of bloodshed and turmoil. The Sudanese must deliver this for themselves, but today they need active international engagement to move in the right direction. Cited in New York Times, “The Fall of Omar Hassan al-Bashir, the ‘Spider’ at the heart of Sudan’s web” by Declan Walsh. Excerpt. 9 am EST: Audio commentary from Alex de Waal, introduced by WPF Research Director, Bridget Conley. The possible brokers of a deal that manages a transition to democracy and avoids the perils of massacre or civil war – the US, the Arab League and the African Union – are calling for restraint, and hoping for the best. 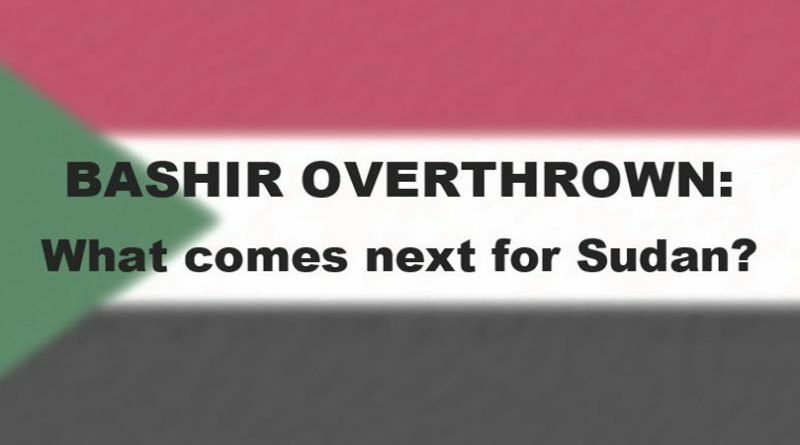 Until now Mr Bashir has been able to manipulate and manoeuvre and keep afloat amid Sudan’s turbulent elite politics. It’s been Sudan’s misfortune that their large-scale popular uprisings – in 1964 and 1985 – have been staged when the international community has not been ready to support democratisation. “When you have an intricate patronage-based system, removing the president is like decapitating the head in a drug cartel, said de Waal, the Tufts professor. “You will get an outbreak of rivalry among the oligarchs, which could become a civil war. “The issue in Sudan is not authoritarianism versus democracy. It’s, do you have a well-organized autocracy, a coalition of security chiefs, or anarchy? The worst is the free-for-all,” he said. “The army would like to come out of this as the people who saved Sudan from chaos,” Alex de Waal, an expert on Sudan, told Al Jazeera. “What we see on the streets in the moment is a clear division between some in the army and some in the NISS … which is overplaying its hand,” added de Waal, a research professor and executive director of the World Peace Foundation at the US-based Tufts University.